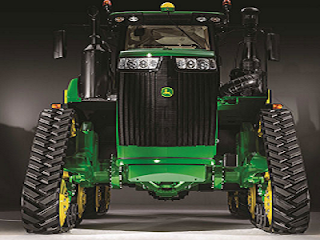 If you are in need of a tractor for 22- to 40- inch row crop application, then the John Deere 9RX tractor is for you. This tractor model is suitable for four-track applications. John deere released 3 different models ranging from 420, 470 and 520 hp to make high speed planting easier. With these new versions, the John Deere 9 Family of Tractors now includes wheeled, 2- and 4-tracks and narrow- or wide-undercarriage configurations. “No other tractor manufacturer offers customers so many choices in high-horsepower tractors, and they’re each backed by the best dealer network in the industry,” says Tiffany Turner, product marketing manager for John Deere. All John Deere 9Rx models makes row-crop farmers cultivate large expanse of lands within hours due to its enhanced capacity, a higher horse power that comes with latest technological engines and enhanced flotation along with plenty of ground-gripping traction. The narrow-undercarriage tractor can be fitted with available 18- or 24-in wide tracks and set to a track spacing of 80, 88 or 120 inches. A roomy, well-equipped CommandViewTM III cab on the 9RX Narrow Track features four-corner cab suspension with four inches of travel, and ActiveCommandTM Steering, providing operators with day-long comfort in the field. “The matched, full-width mid-rollers reduce pressure, heat and wear, and extend wear life of the tracks. Rubber isolators and oscillating mid-rollers minimize cab vibration and provide an ultra-smooth ride,” Turner says. Inside the tractor cab, integrated technology drives efficiency in the field. Important machine functions are easily monitored and controlled using the integrated Gen 4 CommandCenterTM Display. “A touch-screen on the Gen 4 Display makes it easy to watch and manage different aspects of machine performance and precision-ag technology, including AutoTracTM,” Turner says. Large jobs are more manageable and long days in the field quickly pass by thanks to a 400-gallon diesel fuel tank, increased hydraulic capacity and the integrated guidance and information management systems available on these new tractors.